Every year when I read the Hawaii Ironman stories I get that end of the season feeling. The leaves are falling off the trees and for many of us snow is in the forecast. Many of us reflect on our performances this year and start preparing for next season. I find that most triathletes tend to respond to the off-season in one of two ways. Some take too much time off and get totally out of shape and others keep training hard and are seen running intervals at the track. I do recommend a bit of a break this time of the year. I also recommend enough training concentrating on aspects often forgotten during the racing season. Once you finished your last race of the season it is time to take a break. It is important to let your body recover but perhaps more importantly, let your mind rest from all the training and racing stress. Play a team sport, go hiking with your loved ones or go on a skiing trip. You can still do some running, swimming or biking. Just keep it fun and unstructured. New activities will invigorate you. Not to mention that your non-triathlete friends and loved ones would be glad to see you. Once you get started with triathlon specific training keep it easy to moderate and work on your technique. The best time of the year to work on technique is the off-season. During the racing season many athletes are so worried about split times and distance that they forget about technique. Get your swim coach to film your stroke. Concentrate on pedaling circles while on the bike. If your bike is uncomfortable this is the best time of the year to get a new bike or get a professional bike fit on your old bike. Your body will have the time to adjust to any bike changes. For the run I recommend working on some running drills to improve turnover and minimize the time your foot is on the ground. Most top runners can maintain 90 steps per minute or better. Count the steps on one leg only or double to 180 and count both legs over a minute. If you are not sure, try this test. First make sure you have a good idea of your aerobic pace at your maximum aerobic heart rate. Now go out and do between 15-20 minutes of fast running either in the form of interval work (such as 3 x 1000 on the track or 1 x 5 minutes, 2 x 3 minutes, 3 x 1 minute fartlek). Now monitor your body for the next few days. If your aerobic pace gets quicker from this workout, you will probably benefit from doing speedwork. If you get slower or get sick, your body is not in the shape to handle speed work at this time and you may benefit from doing a couple more weeks of base work. I am not sure where I heard this quote but I like it. Every time someone tells me about a great set of repeats or some crazy ride done at an incredible pace during the off-season I use the quote. The likelihood that this athlete can maintain this sort of effort throughout the entire year is not very good. Training takes effort, it causes pain and it wears on you. Save that energy for when it counts later in the season. Being fit in January does not mean that you will be that much fitter by summer. The more likely scenario is low performance during the summer due to over training and getting mentally drained from all the high intensity. I like this motto in general but I want to make sure that training weaknesses does not turn into doing mega-mileage during the off-season. If swimming is your weak sport concentrate on technique improvements rather than swimming 5000 yards five times a week. Most swimming improvements come from technique. If you swim 25,000 yards a week and have bad technique you will be cementing bad technique into your muscle memory and make it that much harder to fix. You will become a very fit slow swimmer. On the other hand if running is your weak sport I do not recommend training for a marathon to become a better runner. Work on your running technique with running drills as I mentioned above. If you have to schedule a running race I suggest distances up to a half marathon. A full marathon for inexperienced runners is generally a very difficult event. It can take up to a month to fully recover and it drains your energy needed for triathlon racing season. But coach I signed up for Ironman Canada and I want to make sure I can run a marathon! Here is my take on that. For most triathletes an Ironman is an exercise in energy management. The great majority of athletes walk during the marathon to insure fluid and food intake. The Ironman marathon is more like a training run. A solo marathon on the other hand is more an exercise in pain management, the pace is high, runners barely break stride to get that half-cup of water. Most runners do not walk unless they hit the wall. It is a very different event. 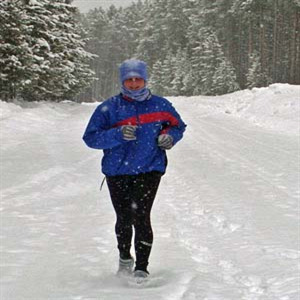 Running a marathon in the winter only proves that you can run a marathon and you can handle a three- to five-hour effort. I have seen many top marathoners struggle during an Ironman. Performance at one does not translate to the other. Scheduling a few long training runs of 20+ miles during Ironman training should mentally prepare an athlete that has any doubts of their capability to complete a marathon. I suggest you save your energy during the off-season and train properly for the Ironman. Finally, if the bike is your weak sport it is usually because of lack of experience on the bike or a bad fit on your bike. Get the good bike fit at your local bike shop, get on your trainer, or go outside if the weather permits. Get a consistent dosage of aerobic riding during the off-season. I find that getting on a trainer is not the most fun activity over the off-season, especially for runners and swimmers. Make that commitment and you will be glad you did when triathlon season comes around. As triathletes we like to think of ourselves as very fit individuals. We run, we bike, we swim, we do it all. Yet we find ourselves getting sore if we go play tennis or from doing yard work. This is even more so as we get older. Strength training will help us strengthen those muscles that we generally do not use in triathlon. . I recommend strength training year round. However, I know that many athletes cannot seem to find the time to do all three disciplines and also hit the weight room. The off-season is a great time to get back on some strengthening program. It will improve your power, and help with injury prevention. Ask your coach to design an off-season strengthening program for you. Start planning your racing season now. You may have to sign up soon as many top races are filling up way in advance. I like having a nice progression to a racing season. Schedule some shorter races early in the season and finish with a big effort on a longer race. Other scenarios are possible. Just be sure to give yourself enough time between races of different distances to do some proper training. This will improve your chances of performing your best at various races and distances. I recommend you work backwards from your big goal races and schedule some shorter races that you can use as stepping-stones on the way. You can start specific training for the intermediate races earlier in the season. These races will also keep you focused and provide a base from which to build on. Enjoy the off-season. I am going skiing.